Cupcakes are one of my favorite desserts. This is because of the variety of fun flavors that they come in. Plus, they are just the right size for a quick snack. No wonder they are becoming so popular for weddings. I have to say that these drink-inspired cupcakes have to be totally unique. 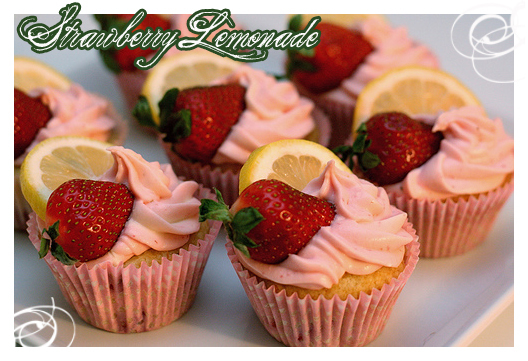 I love the idea of a strawberry lemonade cupcake and a strawberry campaign cupcake would be perfect for any celebration. Just the chocolate covered strawberry alone makes me start drooling! 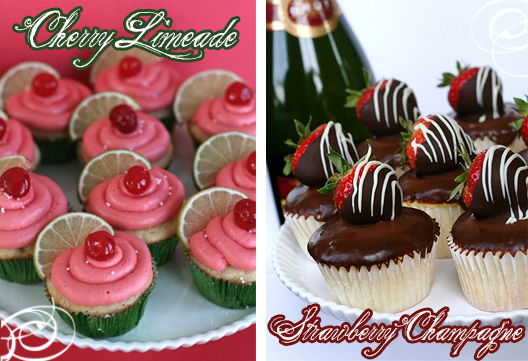 To get the recipes for these yummy drink-inspired cupcakes simply click on the link below each picture. My family absolutely adores brownies. Well… not sure, if it is the brownies or the brownie batter, since they all fight over the spoon. I guess you cannot have one without the other. Right? If you are like my family and love brownies, then you should have them at your wedding. I know some of you are thinking brownies at my wedding. I don’t know…. However, hear me out. 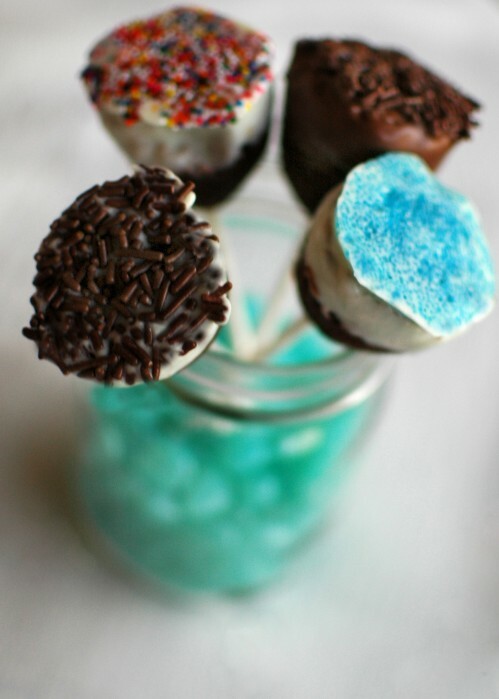 Dress up your brownies and make super fun brownie pops. These would be a great addition or a candy bar or dessert table. Plus, I think they would be a super cute kids table centerpiece, if they were placed in a pretty jar filled with rock candy or jellybeans. I also love the idea of giving these as wedding favors as well. The possibilities are endless! 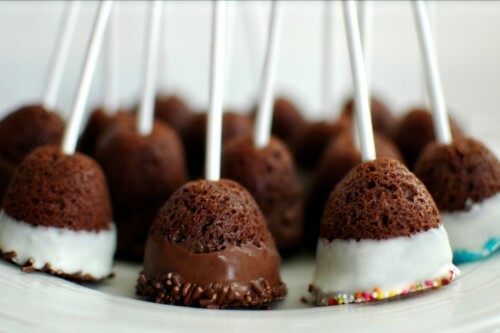 To get the recipe for these yummy brownie pops click here to visit the Intimate Weddings Blog! Cake has dominated the wedding industry for years. However, right now there is a trend to skip the cake all together or have your cake and other desserts too. Maybe cake is not your thing. For many people cake is okay, but they have a dessert that they simply swoon over. (Mine would be cheesecake by the way.) 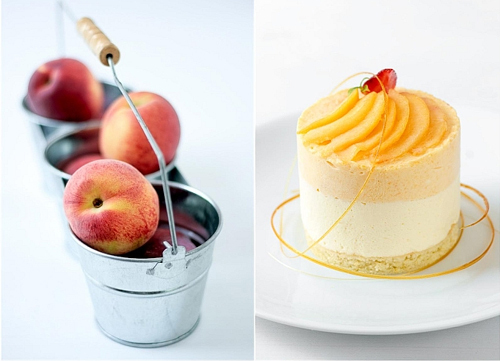 So, why not have that dessert at your wedding? You defiantly should, whether it is only that dessert or a combination of cake and your dream dessert. Below I have listed some fun alternatives or additions to cake. I doubt that cake will loose it’s premier spot, but maybe it will get a run for it’s money! Yum….pie! Almost everyone has a favorite pie. I am guilty of indulging in the occasional lemon meringue pie. 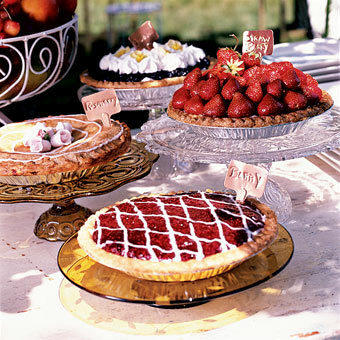 Casual style weddings are perfect for a dessert bar filled with variety of pies. Choose your favorites and display them on beautiful cake stands for a stunning statement. Here is a super fun option for your wedding that will bring out the kid in everyone. 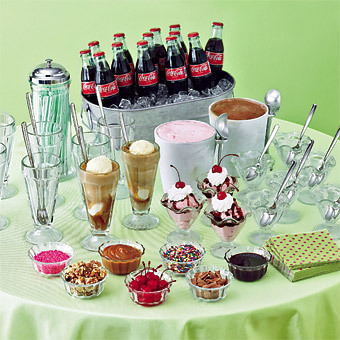 You can set up an old-fashioned ice cream bar complete with soda pop and assorted toppings. Your guests can make their own floats and sundaes. If you are having an outdoor summer wedding, I think your guests would love this refreshing treat! Plus, if you want to go all out, you could have a waiter there making custom milkshakes and malts. Yummy! Here is a treat that brings back fond childhood memories from many campers. S’mores are a beloved treat for many and how fun to set up your own s’mores station at your wedding? Your guests will have a ton of fun toasting the night away. Cookies and milk are considered by most as the perfect pair. So, what a perfect dessert for a wedding! 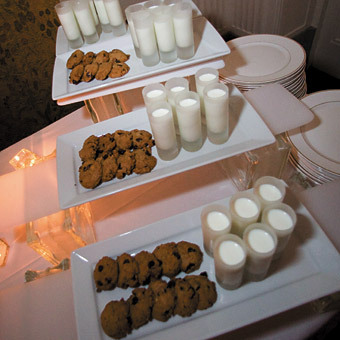 You can serve a variety of cookies and little shot glasses of milk to choose from. Plus, this is a great way to share an awesome family cookie recipe and make the dessert personalized. Okay, I am not sure that I know anyone who doesn’t like some sort of carnival food! I am pretty sure that the majority of people I know would simply drool at the mention of funnel cakes! This carnival inspired dessert bar is a great way to take people back to the fun times at the state fair and other found memories. Plus, the food is good and fun! Showcase snow-cones, funnel cakes, soft pretzels, caramel apples, and other carnival favorites. 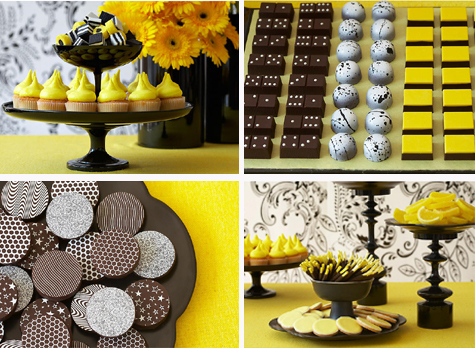 This dessert bar is sure to be a big hit and leave a lasting memory with guests! I am a sucker for desserts! I LOVE them! That is probably why I am always looking for fun dessert options for weddings. Wedding cake is a given, but…..dessert bars are becoming super popular. 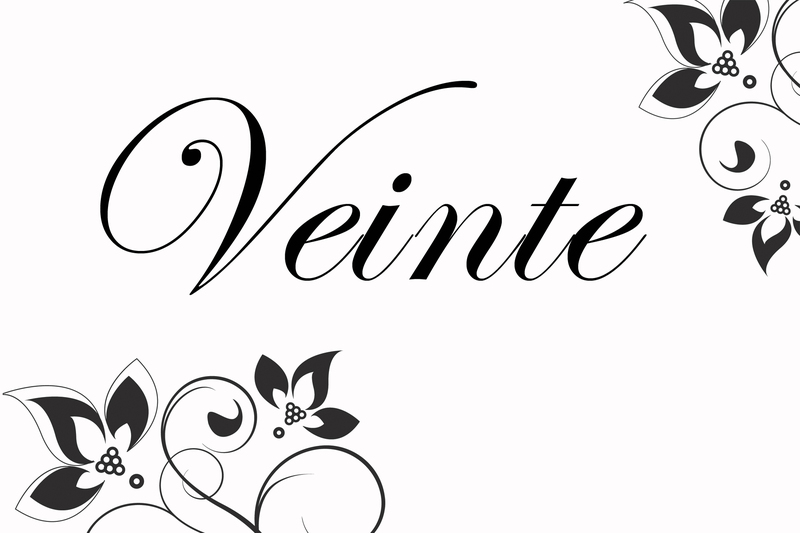 Tartelette is always a great site to check out to get super stylish and yummy dessert options. 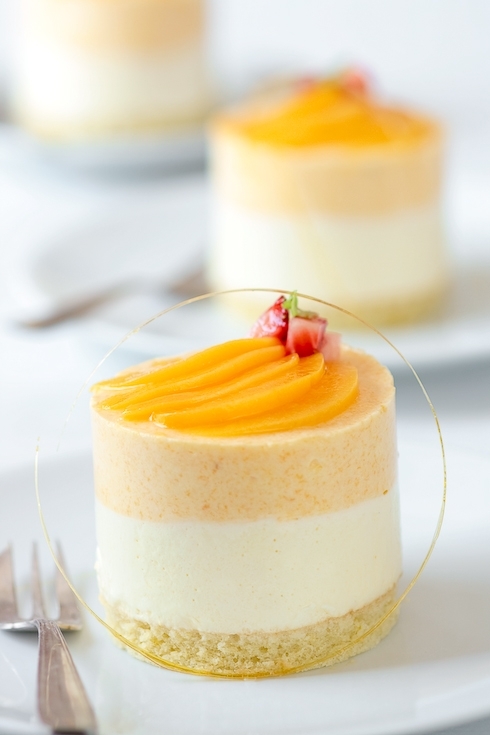 These Peach and Chamomille Mousse Cakes are gorgeous and look soooo yummy! The inspiration was fresh peaches from the farmer’s market. To get the recipe click here! Cupcakes have quickly taken their spot in the wedding sphere. 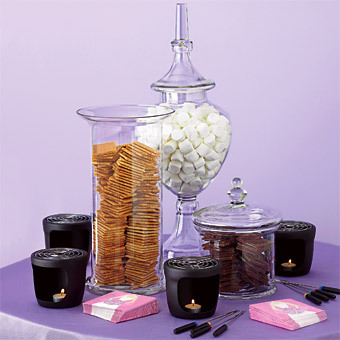 The childhood treat has been transformed into an elegant display at weddings world wide. I love the idea of cupcakes because of the ease of them. There is no cake cutting necessary. Simply grab and eat! Plus they are agreat way to cut the cost of a wedding! 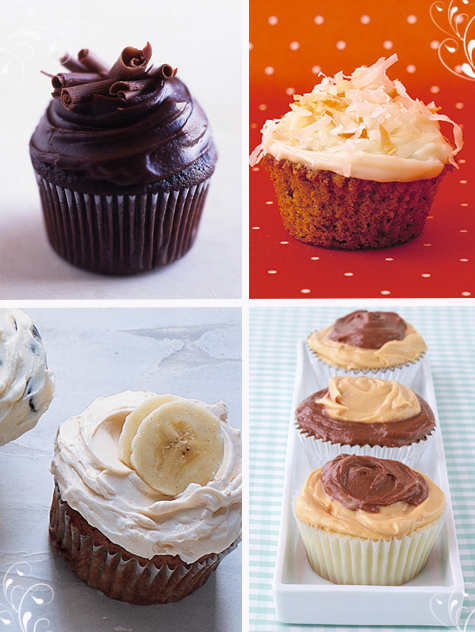 Here are some super yummy and unique cupcake recipes. They are listed from left to right. Simply click on the name and you will be taken to the recipe. Enjoy! 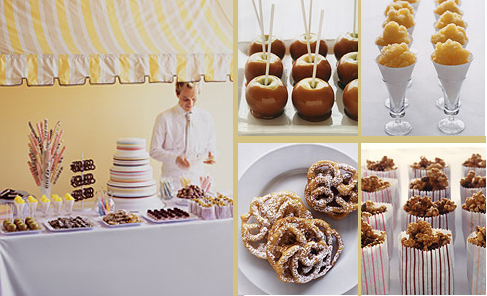 If you are looking for inspiration for your dessert table then go no further than Amy Atlas Events. To me, she is the guru of dessert tables. All if her work is simply stunning! I simply love this Mod inspired table design. 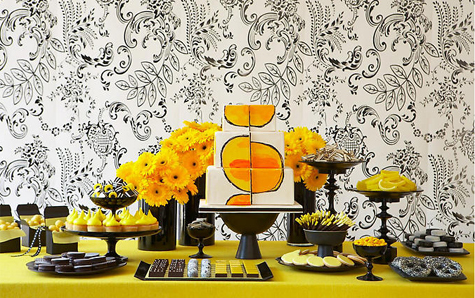 The design consisted of a a gorgeous graphic cake, custom yellow and black chocolates, licorice mints, lemon cupcakes and brilliant, yellow gerber daisies. The combination of these items created a modern, but formal touch to the table. How perfect is this little cake for a bridal shower or luncheon? The name is very fitting as well, Persian Love Cake. I told you it was perfect! 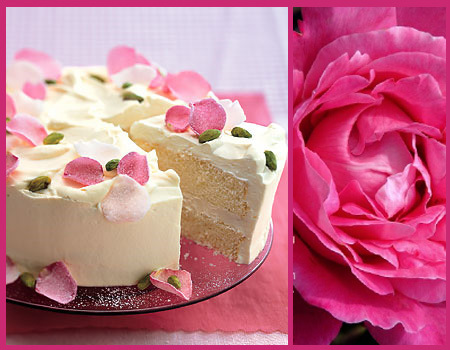 This is a This chiffon cake filled with rose-scented whipped cream and topped with candied rose petals. Here is a beautiful DIY project from Once Wed. 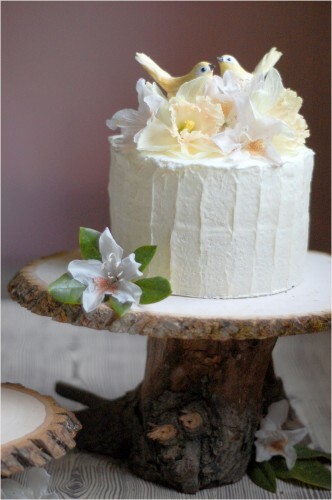 This cake stand reminds me of a woodland themed wedding. I can just imagine an outside ceremony in the spring with cherry blossom trees surrounding the venue, and a sweet little cottage in the background. The bride in a beautiful flowing dress and loose curls following around her shoulders. It sounds beautiful doesn’t it? I love the relaxed and simple elegance of a woodland inspired wedding. I think this cake stand would be perfect for that dream wedding. For step-by-step instruction, check out Once Wed. If you are looking for a great dessert idea for April Fool’s Day then I have just the thing for you! These cupcakes are one sweet trick! They are made to look like corn on the cob but are actually a lot better. 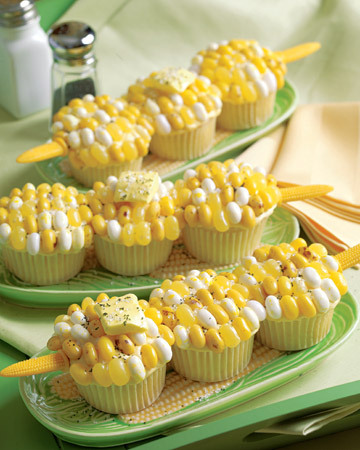 The cupcakes are made by placing three cakes to together and garnishing the top with varying colors of yellow jelly belly’s. The butter is made of a slightly melter fruit chew and then the “corn” is sprinkled with green candy sugar. They are so cute and are sure to steel the show at an April bridal shower or even a BBQ themed shower. Simply adorible!!!! Check them out!!! Pink and black make a beautiful combination. Especially when they combined with the polka-dots! I love the details in the tie and the cake. This makes for a very modern look. I also like the small details such as the coffee beans with the flowers. Coffee beans make a great filler for flowers and plus they smell really good.